Change is coming to the top-selling midsize truck in America. Toyota Motor Corp. will unveil its 2020 Tacoma pickup at the Chicago Auto Show in February. The automaker released a teaser image that reveals a freshened look. Little else is known about the 2020 Toyota Tacoma. Any update to the truck is critical. Demand for the Tacoma is increasing as consumer preference continues to shift from smaller passenger cars to larger light trucks – a category which includes crossovers, SUVs and pickup trucks. The teaser image shows a 2020 Tacoma that shares the same basic outline as the current model. The most apparent difference is the headlamps. 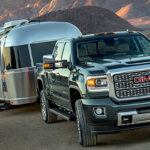 The design has slimmed into a narrow squint more in line with styling of the company’s Tundra full-size truck and RAV4 crossover. It also features more prominent LED daytime running lights which nearly encircle the entire light. The update is a refresh of the existing model rather than a fully new vehicle. Toyota currently offers the Tacoma with a 2.7-liter four-cylinder engine or a 3.5-liter V6 engine. It rides on a platform first introduced in 2015 that provides a reliable drive, particularly for off-road adventures, but lags behind some competitors in comfort. The Tacoma enjoys a passionate fanbase due to its value and versatility. Sales grew 24 percent from 198,000 units in 2017 to 246,000 in 2018. That figure accounted for nearly half of the 494,000 midsize pickup sales in the U.S. It is also one of the most profitable vehicles in the Toyota lineup. “We really had insatiable demand,” said Bob Carter, executive vice president of sales for Toyota. But new competitors pose a threat. Ford re-introduced its Ranger to the U.S. market to capture growing midsize sales. Fiat Chrysler Automobiles will soon deliver its extreme Jeep Gladiator to dealerships as well. Toyota is confident the Tacoma will continue to succeed in a crowding market, Carter said. The company is expanding production of both the Tacoma and Tundra with the introduction of a new manufacturing plant in Guanajuato, Mexico in late 2019.